It is the biggest and most grotesque case of hypocrisy in human civilization. The fact that the United States of America, a nation created from immigrants, would have a horribly dysfunctional problem with other people coming in. Oh, we have no problem whatsoever with people who look like us and sound like us that want to come to America. But we take issue when “other people” come. People who don’t look like us or sound like us or speak English like us. It didn’t matter if it was Irish, Italian, German, Greek, Russian, Chinese, Japanese, Cuban, Haitian, or Mexican. It didn’t matter if they were Jewish, Muslim, or even Christian. If they weren’t like us, if they didn’t speak like us, if they came from someplace else, they suddenly “weren’t welcomed” in this supposedly “great” nation of ours. The events of the past few weeks of this column’s posting only magnifies this glaring hypocrisy. 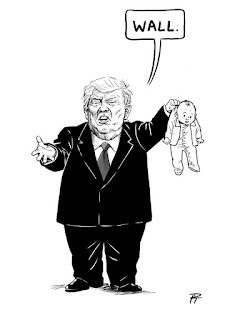 America’s biggest showman of this hypocrisy is a narcissist who swindled his way in a self-professed “rigged system” to become the President of the United States, and the victims of this hypocrisy have been families taken into camps near the border with Mexico. President Donald Trump and his lackey, Attorney General Jeffrey Beauregard Sessions, enacted what they claimed was a “zero tolerance policy” about illegal immigrants back in April of 2018, but didn’t implement it until recently. Basically declaring that anyone coming over from Mexico was guilty-until-proven-innocent of breaking the law and throwing them in detention centers. But the most insidious of their actions was to separate the children from the parents they deem to be criminals and put those children in separate “holding areas”. By now we’ve all seen the images of crying kids in cages, warehoused like animals in some closed-up WalMart store, with nothing but the clothes on their backs and some mylar runner’s blanket. It was worse than the sickening display of Muslim concentration camps of twenty years ago in Bosnia-Herzegovina, not only because it involved children, but because it is going on here in America. A country that is supposed to be better than this! Even worse has been the way that Trump and his acolytes have been dismissing and excusing the policy of taking kids away from their parents. With the complicit Secretary of Homeland Security lying about there being “no policy”, to Trump’s out-and-out lies about this going on because of some non-existent law passed when Bill Clinton was in office, to Fox News propagandist Laura Ingram claiming that these detention centers were like “boarding schools” or “summer camp”. Let’s not forget the favorite claim of the Trump propagandists that these crying children are all “crisis actors”. And, when all fails, we have the demented troll himself, Jeff-Beau Sessions, claiming that it’s okay because “the bible sez so”, and White House Hack “Mean Girl” Sarah Sanders saying it’s okay because “it’s very biblical to enforce the law”. You know, for the law that really doesn’t exist, which justifies a policy that they created that they also claim “doesn’t exist”. During this time, we’ve also seen the Narcissist Trump “save the day” with an executive order to override the policy that he implemented, which is like the arsonist putting out the dumpster fire that he started and then demanding praise for doing it. But it is a “save” in claim only, because his policy is still blanket-detaining people who cross the southern border and evaluating whether or not they “deserve” asylum status later… if at all. And the kids already separated? Well, we are supposed to take the word of the very people who claimed that a policy “didn’t exist” and that the victims were “crisis actors” that those same kids are being reunited with their parents. We are supposed to trust the word of known liars who just got caught lying to the world. Think about that. But there’s something else lurking that nobody wants to really discuss, and that is the underlying motive for all of this misery and suffering. President Donald Trump wants his ego-wall. You know, that colossally-expensive monstrosity that would divide the United States from Mexico and be the largest U.S. structure in the world. One that could be seen from space. The monument to his ego. The one that he promised that Mexico would somehow pay for. That has been his premiere campaign promise, and it should be painfully clear to everyone that he will do anything to get it. And it is also painfully clear that he does not care who really pays for it, just as long as that “someone” is not Donald John Trump. This is not the first time that Trump has threatened harm to people if he doesn’t get his ego-wall. It was this time last year that Trump promised a “deal” with the Democrats in Congress concerning the children of illegal immigrants, many of whom are now adults, and are threatened with losing their education and even being sent back to a country they do not remember being in. It was a deal that Trump then revoked when the Democrats balked at his ego-wall. He’s threatened vetoes on spending bills that don’t include spending on his ego-wall. He’s even threatened to shut down the government if he doesn’t get his ego-wall funded immediately. And now he has threatened children to get his ego-wall funded. Shocking, yes. But anyone who truly grasps who and what our President is would know that this is normal for someone like him. Let’s get brutally honest here... we are dealing with a narcissist who will do anything and everything to get his way. Narcissists have no concept of boundaries. They have no sense of empathy. They do not care if they do harm. They do not care who gets hurt as long as it is not themselves. All they care about is getting what they want. And our narcissistic President wants his ego-wall. We need to understand that as long as this man is in the White House, he will do everything he can to get his monumental ego-wall built. If it means making deals, if it means cajoling people, if it means threatening them, bullying them, starving them, shutting down the government, making people suffer, even threatening the safety and very lives of women and children to get it done, so be it. As long as he has the unchecked executive power to inflict pain and misery, his will be done. There are some people who think that we need to appease this man. Give him his ego-wall just to shut him up. The problem with this is that we have just rewarded what he’s done. We’ve embarrassed our nation in the eyes of the world, showing them just how far away we have abdicated our own principles to appease Trump. Everything that we’ve stood for, everything that we represented, everything our parents and our grandparents and our great-grandparents came to this country for is all flushed down Trump’s golden toilet. And all to appease Trump’s ego. And then what? Now Trump knows what it takes to get what he wants. Anyone who has ever been in an abusive relationship knows what will happen next. When the abuser threatens to kill the family pet or hurt the kids and they get what they want, they know that’s their next go-to. The next time around, they start with killing the family pet or hurting the kids, because they know it works. And if it doesn’t, then they escalate. The next time around, Trump will start with the horrible stuff, because now he knows that this is how to get his way. It’s probably a good thing that Trump has pulled America out of the United Nations Human Rights Council. As long as Trump is in the White House, and as long as the GOP is serving as his enablers, we have no business being there. We may have forfeited any claim of championing human rights a few presidents back, but we should be more concerned with what additional atrocities America will be guilty of in our quest to appease our narcissistic leader. Because, when it is all finished, Donald John Trump will never be held to account for his actions. We will. America will. Ask the people of Germany or Japan if you don’t believe me.